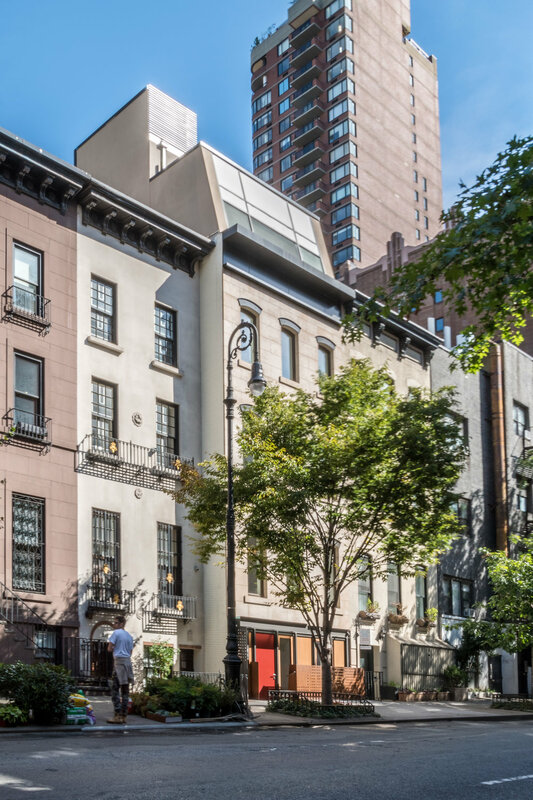 What do you do when you are faced to reuse a small, mediocre, 100 years old structure, non-Landmarked, which has been altered and stripped of numerous details? do you preserve everything for the sake of it or do you change “something” giving new significance to the building? 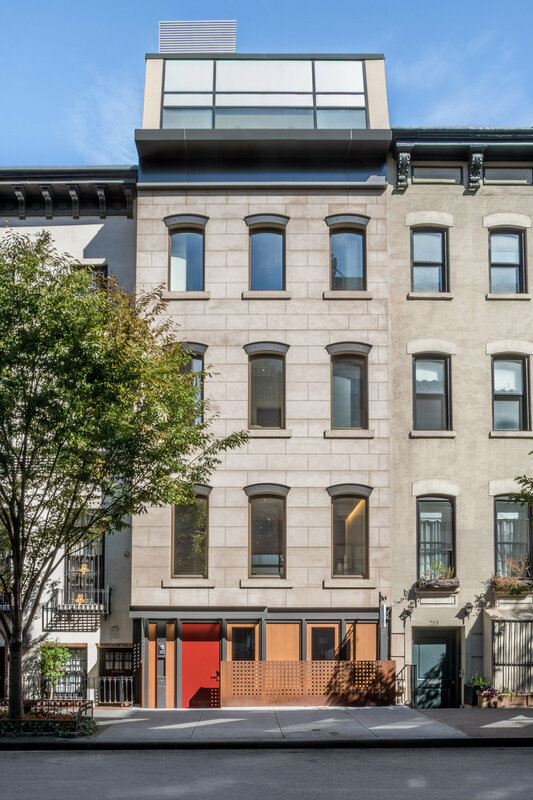 This turn of the century, four-story brick townhouse with an exceedingly rare two-story rear carriage house, is not landmarked; at first the townhouse seemed to be in a mediocre preserved condition, but a closer investigation revealed that both buildings had lost most of their original details, in fact, the carriage house façade was nothing more than a plywood painted mask that created three arched openings, clearly too small for any stable.The project offered the unique opportunity to rethink what had become two separate mixed use, heavily altered buildings, into a single, unique, private complexThe project makes the most of the unique conditions, enhancing all of the characteristics that make “townhouse” living desirable, without the downsides inherent to the compact size, on the interior the final result is completely unexpected in a 20’ wide structure, the spaces feel wider and luminous, comfortably equipped by amenities rarely found in townhouses, such as concealed storage and an elevator.The court level, when all the sliding doors are open, transforms surprisingly into an open floor loft space. 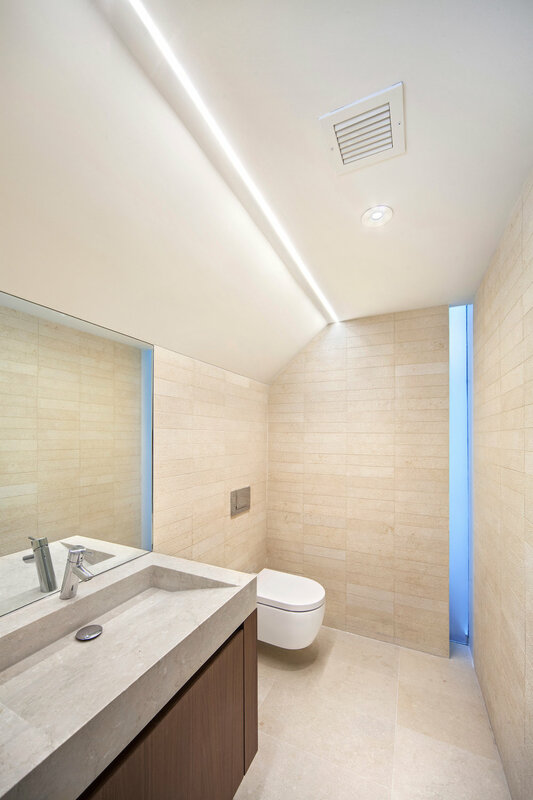 The fully excavated cellar houses needed amenities and an underground passageway, punctuated by skylights, allowing for the combined as well as separated use of the two buildings, it also offers the branding of the project. The other significant alteration was the stripping of the fake brick veneer cladding the Coach House and the its redesign. 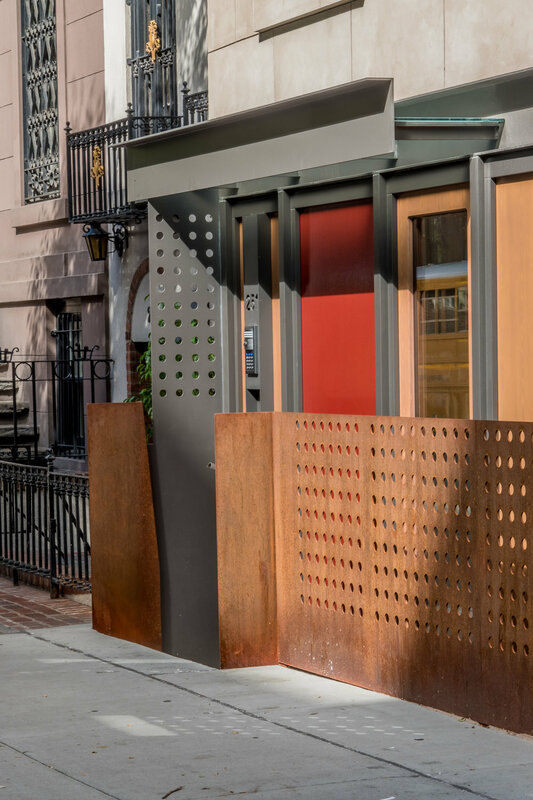 The street facade has been transformed with the addition of a canopied entrance, at the upper floors corten arches and a new corten cornice recreate lost details. 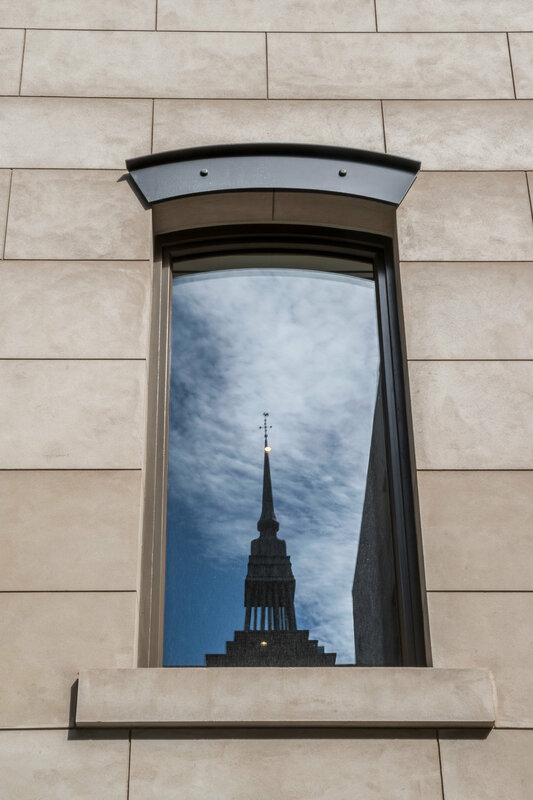 The exterior detailing complements the interior design of the space. 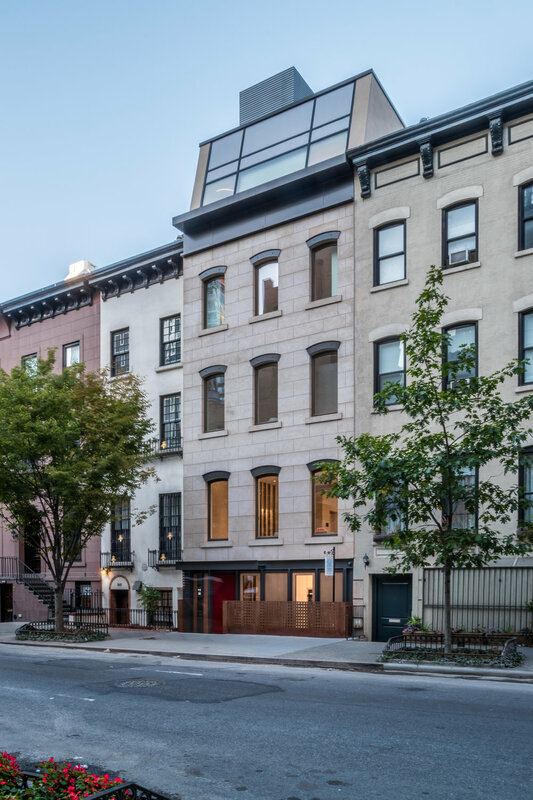 Both buildings open onto the private court, melting seamlessly the indoor with the serene tranquil, open-air living room, flanked by two similar facades. 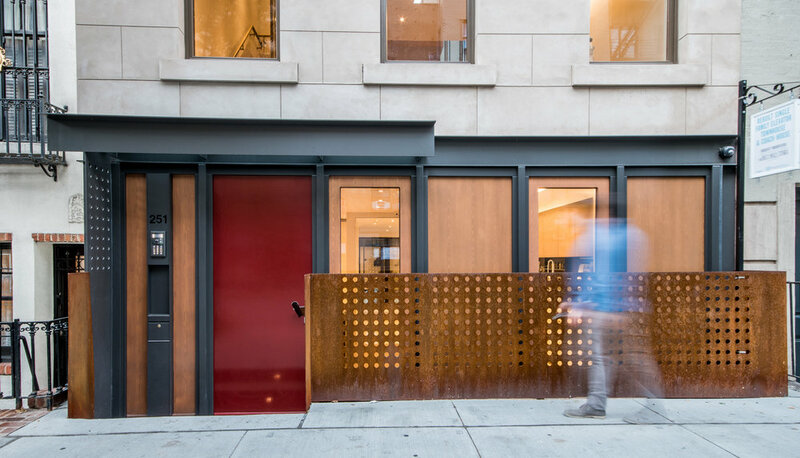 At the top floor glass addition, when the bronze and glass, 18’ wide sliding door assembly doors is open, the room feels like an exterior space, suspended in the green. The view from the top floor truly highlights what luxury is in the City: looking at your own private complex, surrounded by trees. Adding to the private landscape, the green roof, which also insulates the house and slows storm water absorption. The stair, a modern interpretation of the traditional stair hall, finds its place in a slot behind the fritted glass and bronze screen which rises through the public spaces, a 20’ high precious marble fireplace connects the living room and Den. 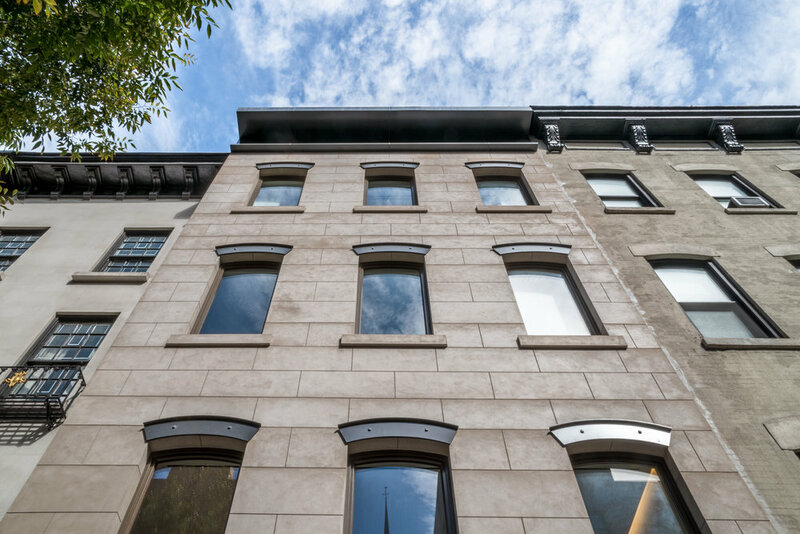 The completed renovation gives back to the Street a whole, substantial Façade that completes the impressive row of historic townhouses that precede it on the East, adding to the quality of the District.. 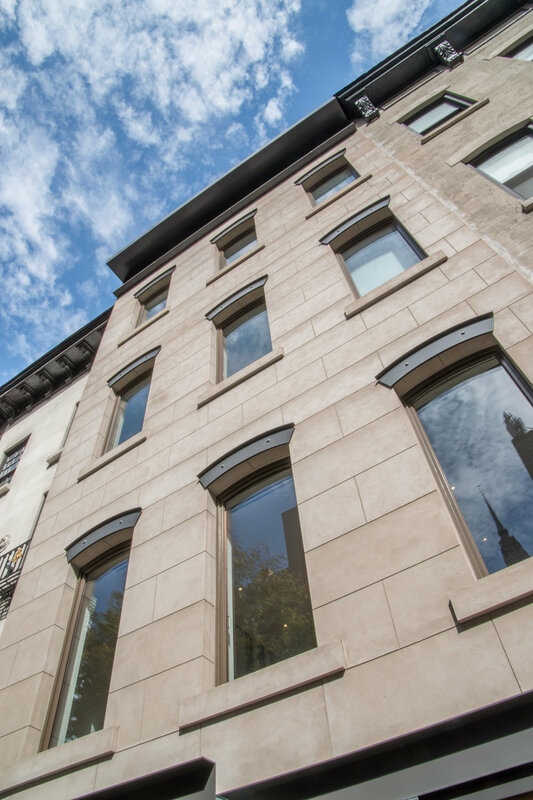 The concept was conceived in collaboration with the Developer, Petro Management, and the broker, Robert Morrison, from Douglas Elliman. 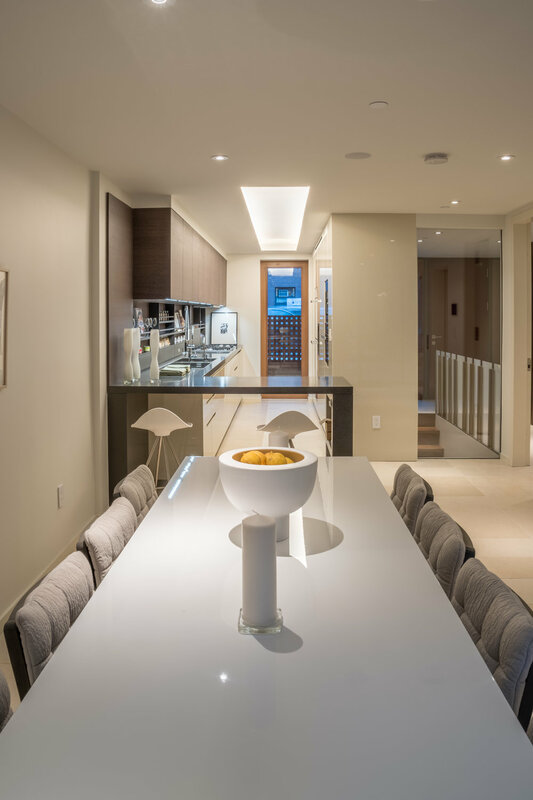 TRA studio has been instrumental in collaborating with the client, working in a shared project management capacity. TRA has been responsible for preparing and continuously updating the project schedule and preparing shop drawings. 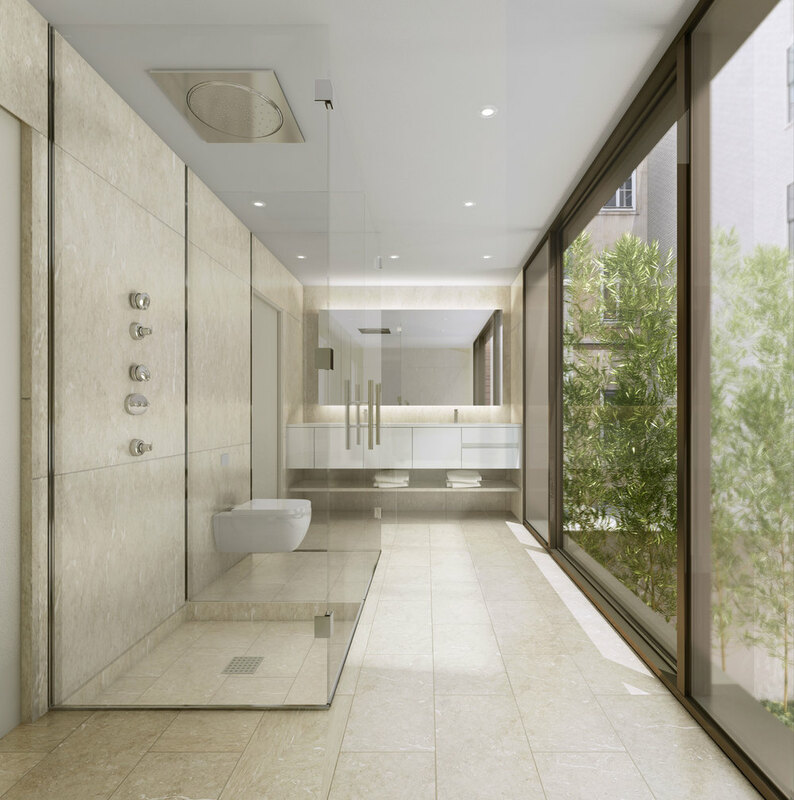 TRA also developed the marketing renderings, which not only illustrate the design to a potential buyer, but also were instrumental in developing the construction details.